Just found out that one of my pieces — Little Tapestries/Ghindia — was juried into the book SHOWCASE 500 BEADED JEWELRY, Lark Publications. The book comes out August 2012, but is already listed on Amazon.com at http://amzn.to/z6tZH2 . 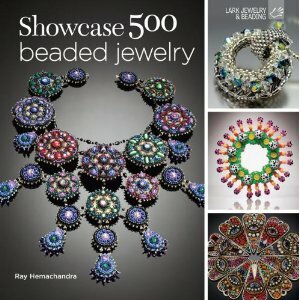 This book gathers photographs of 500 of the most breathtaking beaded jewelry designs created in recent years. The techniques the beaders employ are as varied as the aesthetic sensibilities they bring to their gorgeous creations and include beadweaving in every stitch imaginable, embroidery, quilling, loom weaving, and kumihimo braiding, as well as basic stringing, simple wirework, and fine metalwork. 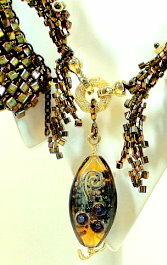 Sometimes, a bead maker’s focal piece simply is set in a straightforward, unpretentious, and beautiful design. 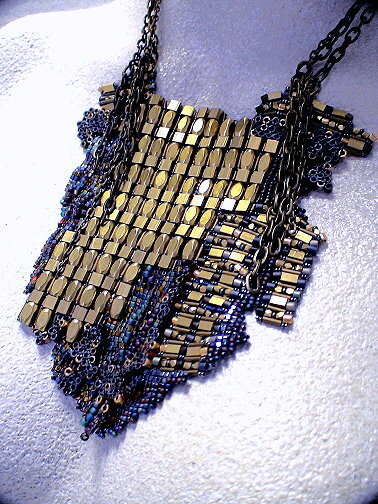 Virtually all of the world’s most famous beaders who make jewelry have pieces included — including Carol Wilcox Wells, Diane Fitzgerald, Marcia DeCoster, Jamie Cloud Eakin, Huib Petersen, Paulette Baron, Sabine Lippert, Sherry Serafini, Margie Deeb, Maggie Meister, Melanie Potter, Ann Tevepaugh Mitchell, Laura McCabe, Suzanne Golden, Jean Campbell, Rachel Nelson-Smith, Eva Dobos, and many more — but we also present work from many artists who have never been published before. All together, this extensive, international, and fabulous survey of 500 pieces includes work from nearly 300 artists from 30 countries and reveals the striking vision and ambition of today’s beading community.